FAMOUS MATHEMATICIAN - Blaise Pascal was a French mathematician, physicist, inventor, writer and Catholic theologian. He was a child prodigy who was educated by his father, a tax collector in Rouen. 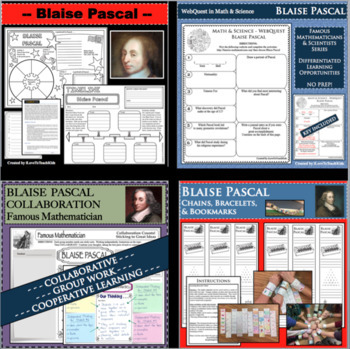 Engage your learners in FUN, INTERACTIVE, and CREATIVE ways while learning about BLAISE PASCAL using a multitude of resources to investigate and discover interesting facts about this famous scientist. All activities are NO PREP and READY TO GO! Great for sub (substitute lesson plans). Each works well as a quick, textbook-free, in-class, or homework activity. Just print and go! Great for interactive notebooks, test prep, review, and showcasing your students' learning! WEBQUEST - Activity is differentiated allowing students to respond to open-ended questions reaching individual levels. WebQuests are designed to provide teachers with opportunities to differentiate by allowing students to respond to a varying range of questions. CHAIN / BRACELET / BOOKMARK - Templates can be adapted to meet your specific classroom needs. COLLABORATION with POST-ITS - Allow your students to collaborate with others! In a cooperative group of up to 4 members, students will work independently and then together to show their learning. TIMELINE ACTIVITY - Students are to find 5 events to include on the timeline and choose a quote that they liked the most and explain why. POSTER (INTERACTIVE NOTES) - Students are to find 8 pieces of information to include on the puzzle pieces, write a postcard to the person, and draw his/her portrait. ACROSTIC POEM - A blank template with each letter from the person's name is formatted and ready to include information, observations, or opinions from his/her life that your student chooses.